The golden hue of the day's last light presents a red tail hawk circling and soaring above the valley floor. In the distance staunchly squats the granite peaks of the Tetons in Jackson, Wyoming. Flying in tandem, is Becca Bredehoft, in a paraglider, enjoying the same smooth evening air and the impressively smooth movements of the redtail hawk. Forward flies the hawk as Becca drops off, banking a left turn and down into a spiral gaining momentum before she dampens the bank angle, and carefully glides back into forward flight, catching lift and rising back up toward the peaks. It's another night of aerobatic playtime for Becca, winding down-literally- after another beautiful day in Wyoming's greatest mountain valley range. When you ask people about their dream job, what they would do if they were a millionaire, you typically hear something about world travel. People will tell you that they want to travel, indiscriminately, not to any place in particular, though they may have a few top destinations on the list. Usually, it's the freedom to go, well, anywhere, that intrigues them. You also hear people mention a hobby or a craft they wish to take with them. "I want to travel the world and take photographs or make films," I hear a lot. But how many people actually get to live out these dreamy liberal arts college style fantasies? Well, some, apparently. Meet Becca. Becca is currently living most people's dream life. Minus the whole millionaire bit, of course. 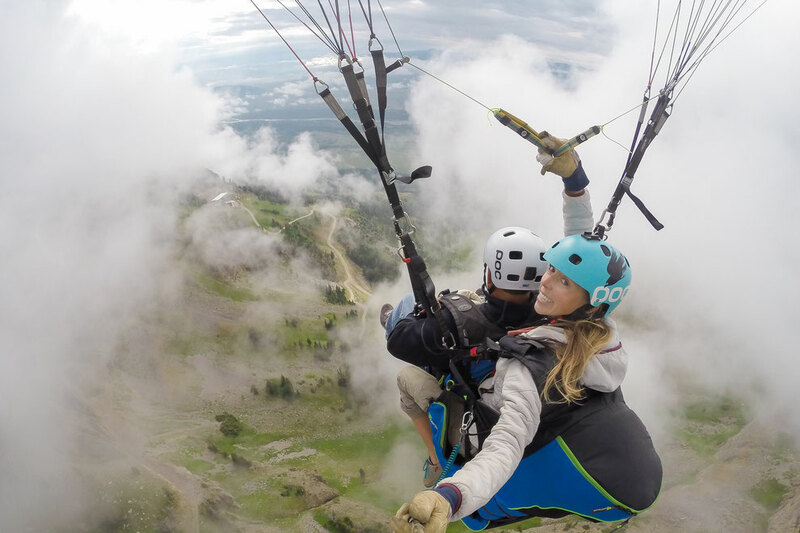 Becca Bredehoft, 32, based in Jackson Hole, is a world-traveling photographer and paragliding pilot, a sport that uses wind to power flight. Paragliding 200+ days/year and on call to fly commercial tandem flights 300+ days/year, Becca is one of a growing handful of women that pursues paragliding year round as a lifestyle and as a tool to travel the world and its terrain in ways very few people can- from the air. Bredeheoft has traveled to Ghana, Costa Rica, Togo, Mexico and Central America, New Zealand, South Africa- you name it. For someone who once jokingly referred to herself as a paragliding bum, Bredehoft is keenly aware that she lives a charmed life. Having traveled all over the world to paraglide, living in a suped-up van with her partner (also a paraglider), a talented photographer, and yoga enthusiast, it doesn't take much imagination to believe this aviator-photographer sports a pretty charmed existence. But it wasn't handed to her and it doesn't come without its own set of compromises. What Becca has done is design a lifestyle that she prefers to that which she saw commonly around her. "I honestly think I fell into this lifestyle very naturally. The thought of getting a 9-5 job or buying a house or living in the same place for the rest of my life has always sort of terrified me." Contrarily, much of what she does likely terrifies the average person. But Becca and partner have another mission planned: The Pan American Migration, they are calling it. "I've always got plenty of crazy ideas that I'm trying to realize, but at the moment my boyfriend Cade and I are working toward building a small plane and flying it from Northern Alaska to Southern Chile, paragliding along the way." From building a small airplane to fly across the continent, life in a van, good luck charms, how to live simply, overcoming traveling anxieties, and flying with birds, Bredehoft shares with us an exclusive glimpse into how she began this journey and where it is taking her. M: What does a typical "good day" look like in your life as a traveling paraglider? Well, one of the primary features of my life is that no two days (or flights) are the same. So this would be a version of the ideal day, but certainly the weather does not cooperate to do this all the time…. I would wake up before dawn and hike up a hill near town, arriving on top shortly after sunrise. I would unpack a speedwing or lightweight paraglider and fly back down to the valley floor, grab a quick coffee and breakfast, and head to work. I would fly as many tandems as the bookings and weather allow—anywhere between 3 and 8 on a good day depending on the site. After work, I usually hope to squeeze in at least one more solo flight of some sort—whether it’s an acro lap practicing tricks, a cross country flight using thermals to fly from one place to another, or a soaring flight using dynamic ridge lift to stay aloft in wind. Depending on where I am, I usually will still be out flying til late evening. Then of course I’ll end up chatting with friends and watching the sunset after this amazing day of flying. Which means I’ll get home after dark, make dinner, and get to bed as early as possible to get up and do it again the next day. Somewhere in there I try to find time to cook, clean, do yoga, and maintain friendships with non-flying friends. You have flown all over the world. Where are three places you have gone to paraglide that the general public may not assume ideal for recreation or for paragliding? I have travelled to Ghana twice to fly tandems for a paragliding festival (with a side trip to Togo on the second trip), twice to Nepal to work as a tandem pilot, and three years ago my boyfriend Cade and I drove from Wyoming to Costa Rica and back, paragliding throughout Mexico and Central America. You work as a tandem pilot taking passengers for flights in Jackson Hole May through September. Where do you spend the rest of the year? I have worked in different places around the world over the past 6 years. I’ve spent a few Southern-Hemisphere summers in New Zealand, two partial seasons in Nepal, one winter in Central America (mostly in Guatemala), and one partial season volunteering in South Africa. I usually travel in the spring and fall, visiting friends and family and occasionally traveling internationally purely for solo flying. How do you decide where you will spend a given winter season after your tandem season is finished in Jackson Hole? Part of this lifestyle is always being open to new opportunities. Cade and I have been traveling to New Zealand to work on and off for five years now, so we’ve got a pretty solid base of connections and friends there. It’s sort of a second home for us and is a great place to work. I definitely have other interests as well though, and sometimes it just takes asking the right people at the right time if an opportunity might be out there. That’s how I ended up working for Parahawking and volunteering with vulture conservation in South Africa. When we bought our Astro Van a few years back, we definitely had the idea that we wanted to do a big road trip with it. When I proposed the idea to Cade of driving to Central America, he was totally in. We had planned to work in Costa Rica for the winter, but we ended up finding a better opportunity with a friend’s company in Guatemala and spending the majority of the season flying tandems there. There are always trying moments of feeling like I don’t know what the next move is, but things just have a way of working themselves out if I stay positive and flexible. Do you get anxious before traveling to a new country? What kinds of things are most challenging? Learning a new site to fly? Navigating a new language or a large city? For sure! I studied Spanish and Portuguese in college, so countries where I can use that knowledge are definitely easier. But I am totally out of my element sometimes and can feel completely lost, in Asia especially. I also tend to feel really uncomfortable when I don’t understand the cultural norms. And I am horrible in big cities. When I can’t see the skyline or major (natural) landmarks, I get really disoriented. In general when I’m traveling, I do my best to avoid big cities as much as possible. Flying is a different story; I feel pretty comfortable showing up at a new site just about anywhere and knowing there will be local pilots that can fill me in. That’s one of the most incredible things about the global paragliding community—no matter where you go, there are locals that often quickly become friends. I couldn’t ask for a better international support system and really don’t think our lifestyle would be possible (or near as much fun) without it. Was there ever a time when in your life when your current lifestyle would have sounded crazy to you? I honestly think that I fell in to this lifestyle very naturally. The thought of getting a 9-5 job or buying a house or living in the same place for the rest of my life has always sort of terrified me. Moving around this much (especially internationally) presents a whole host of obstacles, some that I embrace and some that I just know I have to deal with. But overall, I love the constant change of scenery and new challenges. How and when did you decide to pursue this lifestyle anyway? Was there a pivotal moment or experience for you? If there was any definitive moment it would have been my senior year at the University of Colorado. I spent much of my college career arranging my schedule so that I could take four-day weekends (flying trips) and being outside as much as possible. Despite this, I actually perform well in a structured learning environment and enjoyed school. I never skipped class and was on my way to graduating with honors. So it came as a complete shock to the head of the Environmental Studies department when I informed him that I wouldn’t be needing any job recommendations or career counseling as I was planning on heading straight to Jackson Hole after graduation to pursue life as a paragliding bum. As someone who has been paragliding since the age of 14, what made you want to be a tandem pilot instead of always flying solo? I think for me it was a natural progression, the next step in flying. When I did my first tandem flights, it wasn’t with the intention of pursuing it as a career so much as wanting to have a way to share the experience with my friends. And I actually completed my tandem rating in two stages over the course of a few years, with a big break from flying in between (after a snowboarding injury and some other big life stuff). But when I came back to it and as I finished the tandem rating, acquired the gear, and spent more time working on my skills as a tandem pilot, it became apparent that the most logical way to pay for all of this was to get paid to fly people. At that point I was waiting tables and bartending in order to live and fly in Jackson Hole, and was definitely ready to spend more time flying and less time inside, and I transitioned quickly into working as a full time tandem pilot. Tell us a little about van life. How does it fit with your lifestyle? I am actually kind of OCD when it comes to my space, which can be a challenge when living in (extremely) close quarters with another person. I am constantly rearranging and organizing everything in the van, although you wouldn’t know it looking in from the outside. I really like everything to be in its place, even if that place is just a certain spot amidst the chaos, and when it gets really disorganized I sometimes have to completely stop everything I’m doing and rearrange. I also have a really strong aversion to the disposable lifestyle, so I’ll go really far out of my way to use my own cup, bottle or bag if I can avoid disposable plastic. I have this one blue ceramic coffee mug that fits perfectly in the cup holder in the van that I always use for to-go drinks, which totally confuses the cashiers in restaurants and stores. Especially in Mexico and Central America, everything comes double bagged in extra packaging and it can be really hard to avoid using tons of plastic every day. Cade [my boyfriend] is really amazing about waking up early and making coffee, and I am so spoiled at this point that I struggle to get out of bed without it. One of my favorite features of van life is being able to just open the doors and take in the sunrise, it makes me feel much closer to the world around me. In the paragliding community, people refer to a short flight with no elevation gain as a “sled ride” or a “sledder.” These short flights are often due to inopportune wind conditions and ideal for beginners because of their simplicity. Often times, as we progress with hobbies, we like to engage only at the highest level of our skill. However, I once read a quote of yours where you said, “If I’m flying, I’m happy. I’m never too good for a sled ride.” Do you think this is a quality that you apply to everything in your life or just paragliding? I think it’s definitely something I apply to life. As far as paragliding goes, I think that if I felt like I was as skilled as possible, I would no longer be interested in flying. That is one of the things that is so engaging to me about free flight--there is always something to learn or to be gained, even on a sled ride. Speedflying and aerobatics definitely bring sled rides to a new level, but I also love the simple beauty of hiking up a hill and flying down, no matter how short or seemingly mundane the flight. Some of my most memorable flights ever were sled rides…. Sled rides with good friends, amazing scenery, and/or challenging routes to the takeoff. I think the same applies to life. You don’t have to do something new/ seemingly impossible/ beyond your limits to enjoy yourself or learn something new. I love going back to the basics in lots of places in my life… I’ll go to a beginner yoga class and walk away with new knowledge or perspectives even though I’ve been practicing yoga for 15 years. I read articles about photography online, and will glean new information from even the most basic tutorials aimed at intro-level photographers. And I certainly still have a million things to learn about all aspects of flying. So you fly, in the air, with birds. Tell me about the first time you remember flying with a bird of prey. I’m not sure when the first time I flew with a bird of prey was, but there are some iconic birds around Jackson Hole that we frequently encounter. There’s a Red Tail Hawk that nests on Snow King (one of our flying sites) that is notorious for chasing pilots away from its territory. I have no way of knowing whether it’s the same bird, but local pilots have been chased from the same spot by a Red Tail for at least 10 years. There’s also a Bald Eagle that frequents another soaring site in the middle of town called High School Butte. Again, it’s impossible to tell whether it is the same bird, but this huge Eagle comes out and soars with us on this little hill, enjoying the smooth evening air. There are also a variety of Swainson’s and Red Tail hawks that we see almost daily at Teton Village. Pretty much everywhere we fly there are birds in the sky with us. Two of the most impressive places I’ve shared the air with raptors are South Africa and Nepal. Flying with hundreds of massive vultures in your immediate airspace is an experience like no other. Vultures are some of the most impressive birds to fly with. The larger species can have a wingspan of around 10 feet. That is something you will never be able to truly appreciate until you are wingtip to wingtip with them in the air. They can be awkward on the ground, considered ugly by many, but they are incredibly graceful in the air, taking advantage of lift like no other bird or aircraft can. I think a good comparison to flying with birds of prey is scuba diving with sharks or other large sea creatures. You are also a skilled photographer. What makes paragliding and/or birds interesting subjects? Paragliding generally takes place in aesthetically pleasing locales, and we pilots interact with our environment from a perspective that most people are not accustomed to seeing. The bright nylon colors generally make for a dynamic juxtaposition with the natural surroundings. One of the things that can be frustrating about paragliding is its dependency on weather. This makes flying photography super challenging and yet rewarding. With another sport, say running or mountain biking, you could simply get up at dawn or go out in the evening and take advantage of the good light to get a particular shot. But with flying, the wind conditions also have to be right. So although this can be really trying and can require insane amounts of patience and dedication, it also means that when I get a great shot, I feel that much more rewarded for my efforts. Birds are another element altogether. I find birds of prey to be stunning in form both on the ground and in flight. They are similar to paragliders in that they require lots of patience to photograph. They are quick moving and can be quite elusive. To photograph wild birds of prey, you really have to be in the right place at the right time. And even trained or captive birds can be finicky to catch at the right moment. But I think that there is a power and mystery to birds of prey that really speaks to people. From the shape of their wings as they glide through the air, to the fascinating colors and patterns formed by their feathers, to the intensity of their eyes, I find them totally captivating. What are the logistical challenges of taking photographs while paragliding or traveling? How do you setup your camera when your hands are otherwise occupied? There are a lot of challenges to paragliding photography. I often struggle just to find the motivation to bring the camera along, especially if I’m walking to a takeoff. Any extra weight is not generally welcome, and sometimes I’ll carry the camera on a long walk and end up being disappointed with the light or photographic opportunities. As far as actually flying, I have a small camera bag that I attach to the front of my harness for easy access to the camera while flying. I have spent years getting used to flying my glider one-handed and operating the camera with the other hand. This doesn’t always work out well, but it’s the method I use probably 80-90% of the time. If the air is really smooth, I can let go of the steering lines and use both hands to shoot, but then I can end up missing a shot because I can’t get myself into the correct position for the angle I want. I've missed a million amazing photos for all sorts of reasons, but it just keeps me motivated to continue trying to improve my skills and carry that camera as much as possible! Is there a particular mood or theme you try to capture in each of your photos? When it comes to paragliding photography, I prefer to record the moment with minimal interruption to the natural flow of the action. I try to move myself to get the particular angle I want so that the subject is left to enjoy the flight, and therefore the photo expresses whatever mood is there. This is not always possible, and there are certain scenarios where I will give instructions to get the shot, but I would rather let the moment evolve organically. Paragliding can evoke a range of emotions and feelings—a sense of adventure, adrenaline, solidarity and friendship, pure bliss, nervous excitement, serenity, and awe. I hope that my photos convey a range of all of these emotions to both experienced pilots and people that have never heard of paragliding! How much do you pack when you fly to a new country to paraglide? When I’m going for a whole season, I usually take 4 complete paragliding setups—a tandem, an acro setup, a cross-country setup, and a speed wing. I usually minimize the clothes I bring so I can also pack photography equipment and the necessities for camping as well. Unfortunately traveling light is not easy with this lifestyle! I usually struggle to keep it down to three 50 pound checked bags and two oversized carry-ons that I have to cross my fingers to sneak by the flight attendants. Don’t even get me started on how much I’ve spent on baggage fees in the last 5 years. Do you have any traditions or superstitions when traveling? It’s not necessarily travel-related but I have a reserve pin on a piece of paragliding line that I wear as a necklace. It doesn’t have any particular history, but over the years I have come to believe it brings me good flying fortune for some reason. I also have a tradition of sitting down at the end of every day with a journal and writing down three things about the day that I am grateful for. I think it’s a good exercise in reminding myself what is important and that even when things don’t necessarily go our way, we can find gratitude in a lesson learned or turn a negative experience into a positive outlook. As far as the van goes, we bought a handmade psychedelic wooden figurine in rural Mexico that now occupies the dash board of our Astro (one of my friends calls it the ‘Dash Dragon’). We named him Chupacabra and he definitely has had some sort of protective force around our travels and living space. You have had very different experiences in travel than a typical tourist. For example, when paragliding, you see the country from, literally, a different perspective. How has this affected the way you come to learn about a new place? I actually find it really hard to experience a new landscape as a ‘typical’ tourist. My favorite type of introduction to a new place involves going directly to the nearest hill and seeing it from the air. If I can walk to the takeoff and fly down it’s even better. Beyond the obvious advantage of seeing a landscape from above, I personally feel more comfortable going to a new place with the intention of flying. It’s a great icebreaker to tell a local person that their area is perfectly suited to paragliding and that I’ve come from very far away to fly there and can give you an interesting entry into an unfamiliar culture or situation. Do you have any new projects you are working on that our audience should keep an eye on? I’ve always got plenty of crazy ideas that I’m trying to realize, but at the moment Cade and I are working towards building a small plane and flying it from Northern Alaska to Southern Chile, paragliding along the way. We’re calling it the Pan American Migration. It’s still very much in the planning stages, but we are super excited about the prospects. In the meantime we have just finished up a slightly less technical buildout of our Sprinter Van, which we have been living in full time for the past 6 months. We are excited to be even more mobile for our future adventures. What kind of planes are you looking at and what does "building a small plane" mean? It is a two-seat, low-wing 'experimental' aircraft. It's a small cross country plane that is also great for aerobatics and super fuel-efficient. Building a small plane means just that--you order a kit with all the pieces and assemble the entire plane from the ground up. The process generally takes a few months of full-time work for two people. Why is this mission important to you personally? A few years ago, when Cade and I drove to Costa Rica and back, we were really inspired to continue the journey to Tierra del Fuego (as far south as you can go!). Although we didn't have the time or the funds to continue past Costa Rica on that trip, we definitely plan to drive the length of the Americas at some point in the near future. Two years ago we both started training for our private pilot's licenses. As we got more into flying planes, we realized how easy (and fun!) it is to access some really stunning terrain in a small aircraft, and often takes less fuel and far less time than it would in a car to get to some really amazing locations. From there the idea just snowballed and pretty soon we were talking about flying the length of the Americas in a home-built plane. I think for us it's really about the adventure--learning new skills, seeing new places, getting lost a bit, meeting people and exchanging ideas, and finding ourselves somewhere along the way. What are the obvious challenges? There are a lot! Cade and I are still very inexperienced pilots. I haven't actually finished my private license (it's on the to-do list!). So we definitely have a lot of training to do on that front. We also have never built a plane--we're excited to learn all about that process. And the major obstacle will be funding the project. We will be able to sell the plane after the adventure, but we'll need some investors to cover the initial costs of the kit and build, and of course the actual travel expenses. Selling ourselves (or selling anything really) has never been a strong point for either one of us, so this will be the hardest part for us! Were are the hidden/unexpected challenges so far? We really haven't had any surprises thus far, but we're only in the beginning stages. I'm a pretty practical person and tend to look at all aspects of something before I dive in, so Cade and I have extensively discussed the reality of what we're getting ourselves into . As we get further along in the project, there will surely be challenges and setbacks. Stay tuned! How can people follow your adventures online or through social media? You can check out my photography website at rebeccabredehoft.com, where I am in the process of getting my blog up and running. I also post a lot of my day-to-day flying adventures on Instagram (@rhbredehoft) and on Facebook (Becca Bredehoft). 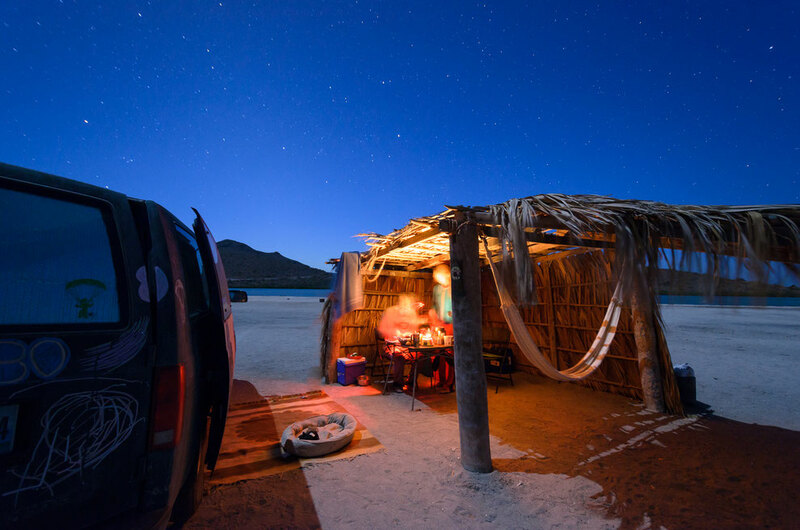 I’ve also been chronicling our land- based adventures in van dwelling and the conversion of our Sprinter van on Instagram at @aves_sin_rumbo. Becca Bredehoft is based out of Jackson Hole, WY.